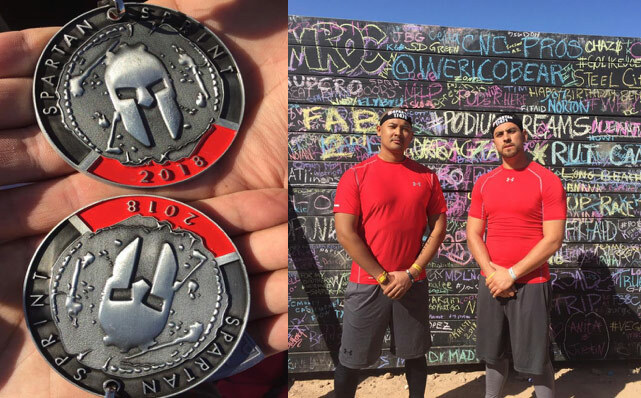 Spartan Race in the desert was nothing like what you'd normally think of when racing in the desert. Most of us expect Arizona to be hot & unbearable, but that was not the case at all this past weekend with perfect weather in the mid-70s. The sights, sounds, and smells of the event filled the air as we approached – the experience even included with food trucks this year! The venue was surrounded by steep hills silhouetted by the rising sun, and you were greeted by the echoing grunts from challenging obstacles, racers counting their burpees nearby, the rising smoke and cheers from the fire jump, and the clanging of new medals. AROOS! from the start line could be heard from the first minute you arrived. 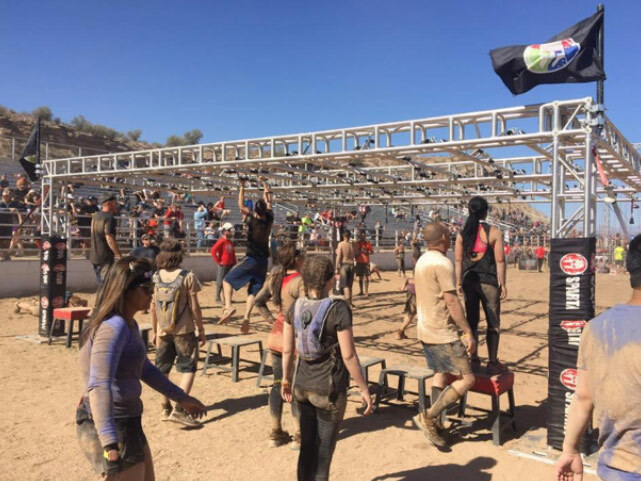 Fort McDowell was a great location to hold an OCR and is only 23 miles northeast of Sky Harbor Airport. Scottsdale was only about 15 minutes away and offered a variety of attractions. Parking for the race was offsite at the Fort McDowell Casino and with bus transportation, it took 5 minutes to get to the race festival area. Running in the desert is different from standard trail runs with thick sand, rocky terrain, dusty wind to dry your throat, and not a flat spot in sight. If you came to AZ to see a majestic saguaro cactus or two, you weren't disappointed as they were everywhere. The course went from the flat festival area through a network of trails that use up as much of the natural hilly, rocky climbs as possible within 4.5ish miles. While many of the steeper climbs were hard-packed, there were a few climbs and descents that were sandy and made you work even harder to keep your footing. Once you made the climbs, the views were spectacular! There was one spot at the very top of the course where you could see for what seemed like hundreds of miles in each direction from the top of the cargo net. I participated in the Sunday Spartan Sprint, which was about 4.5 miles with 25 obstacles. Upper body strength & balance was needed right at the beginning with the array of wall climbs before plenty of desert trail running. Midway thru the course we came across a gauntlet of grip-based challenges: Olympus, Tire Flips, Sandbag Carry & Rope Climb – and then they sent you back into the hills for more running before nearing the end and all their signature obstacles one after the other: Barb Wire Crawl, Rolling Mud Dunk Wall, Bucket Carry, Monkey Bars, Spear Throw, and more. Last but not least the awesome Fire Jump to the end which is always so epic! This spinning monkey bar obstacle got me, I was unable to make it all the way across the corkscrew of handholds and found myself on the burpee section. While it was a shot to my ego because I thought I could handle it with my good upper body strength. Conquering Twister comes down to timing & execution, every time you put each of your hands on the next grip pad the metal rail would twist as you make your next move and you've got to keep your momentum as well as you can while planning ahead for your next grip. At least I wasn't the only one doing burpees, many other Spartans joined me in that area too due to failing this challenging obstacle. This was a nice upgrade – there are lids on the rock buckets now, which made it so much easier! You can flip them, put them on your shoulders or simply just hug them towards the end. The festival was well organized offering a good selection of food trucks, vendors, and merchandise. The spectator Bleachers offered loads of seating for loved ones to watch the race. Picture booths were fantastic offering cool photos. Finally, a huge beer garden was offered. Everything was well organized & easily accessed. The entire Spartan staff & volunteers were professional & supportive. Overall, my friends and I had a great time. The Sunday Sprint caps off my 2nd Medal of the year, with just a Beast left to collect my trifecta. Overall it was an epic weekend in Arizona. With plenty of nightlife in the surrounding area for a one of a kind celebration post-race. All the locals agreed the best spots were inOld Town Scottsdale or Tempe on Mill Ave near ASU's campus. If you came for sightseeing, the Grand Canyon is a few hours away and the red rocks of Sedona less than 2 hours north. 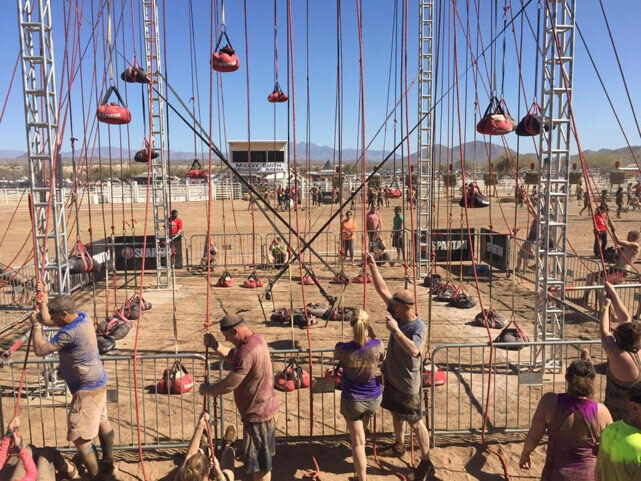 Spartan Race hit a home run with this venue & location in Arizona. The atmosphere was welcoming and overall beautiful. Do I recommend this race? Hell yes. No question about it. You will be challenged mentally & physically. No better way to test your abilities than to get on the course and have some fun with family & friends. I have major respect for anyone who takes on the challenge of an OCR. All your hard work will pay off when you hold that medal in your hand.